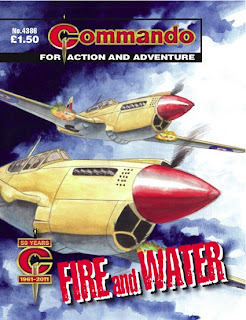 I should have posted this days ago but better late than never as the 50th birthday Commando celebrations continue. As can be seen by the two reprint issues editor Calum Laird and his team are casting their net much further back through the mists of time to present some of the earliest Commando comics to a new readership. And what better "window display" than covers by Jordi Penalva and Ken Barr? South Africans in Catalinas, French in Dewoitine fighters, British in Hurricanes…what a terrific bunch they were! 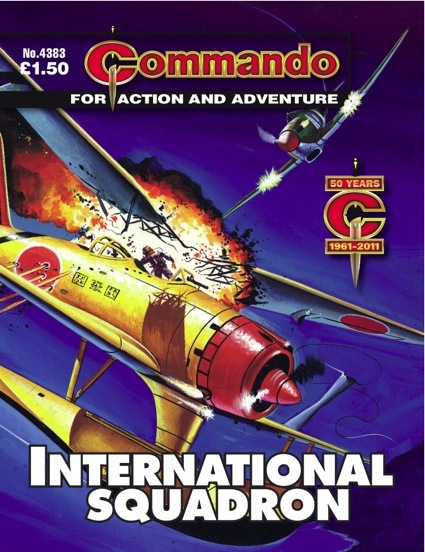 They fought among themselves, they scrapped with the Japs — and to crown it all they had a German saboteur and spy in their midst creating more havoc! This was one story I was sure remembered clearly from 1966 (which was otherwise a pretty unmemorable year). 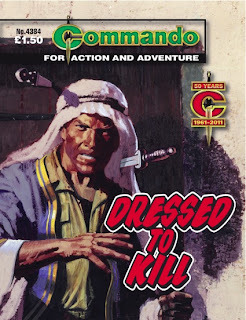 So it was with some relish that I opened the dusty copy from the Commando archives. 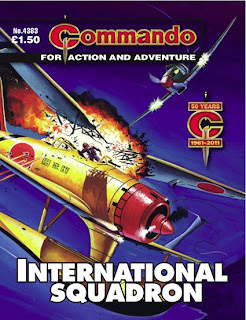 There was Commando stalwart Gordon Livingstone’s artwork bringing to life a story of feuding nationalities almost too busy with their personal quarrels to fight the Japanese enemy. And the whole mixture stirred with a spy in the camp. Just as I recalled. What I had forgotten, though, was Wally the monkey — the real hero of the story. It was quite a sight to see Bert Morris ride to war over the parched desert sands in a battered, bucking jeep…with hundreds of bloodthirsty Arabs thundering along on horseback behind. Branded a coward by the Foreign Legion but labelled a hero by the British Army, Bert’s story of how he raised this rebel army is now told for the first time. And what a story! 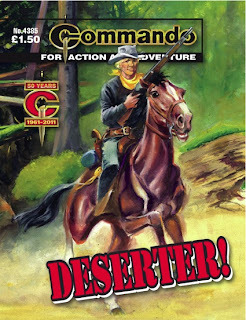 So it’s desert action galore with sparkling artwork by Ramon de la Fuente to bring the best out of Nick Allen’s script. And the wonderful cover by Penalva has won its place in Commando history as the heaviest illustration to date. The paint on the hut wall is authentically deep and rough, lovingly laid on with a trowel I suspect. Abraham Brown’s older brother Robert went off to serve in the US Army in the American Civil War…and he didn’t come back. Abraham followed in his footsteps grimly determined to avenge his brother’s death. But when he discovered that it hadn’t been enemy action that ended Robert’s life but a pack of outlaws he saw only one way to settle the score — and that meant deserting the flag he signed up to serve. John James came from a long line of Royal Navy men. Yet he chose to join the RAF as a pilot. It seemed, though, that his naval heritage didn’t want to let him go. When he ditched his Hurricane in the English Channel he thought it was a one-off incident.